Every so often I get a last minute phone call for help from a friend. In this case Aleksandra needed a promotional poster for a symposium she was organizing to be held at the Prefix Institute for Contemporary Art. 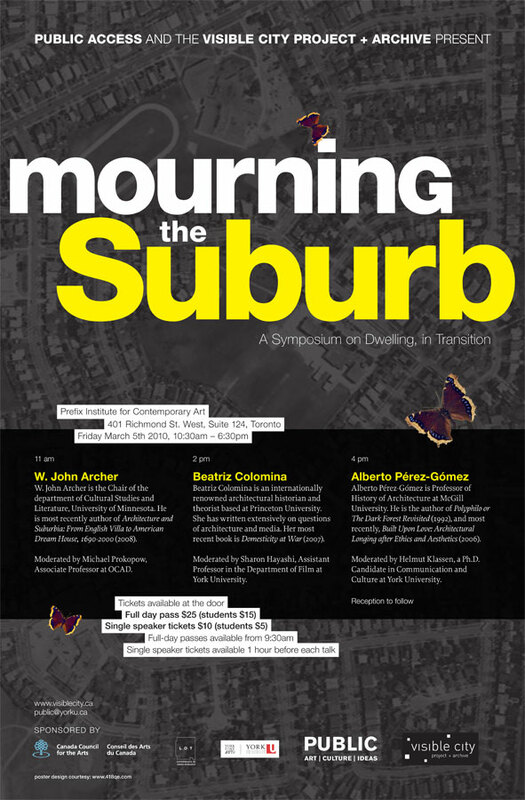 The topic was “Mourning the Suburb – A Symposium on Dwelling, in Transition”. The symposium asked the question “how we know ‘the suburb’'” and aimed for a reflection on the legacy of the suburb through the concept of dwelling. “Dwelling” can have different meanings and in this case was understood not just as different types of architecture but as different relationships between subjects and space which have changed throughout history. For various reasons, this was a last minute project and the poster was needed ASAP. With an understanding that this was to be a quick albeit whimsical last minute job, I accepted and went to work. After spending hours on the first skeletal iteration, Aleks emailed me with feelings of disappointment that it was not like she had imagined and that she needed it to be completely different. Yep, a true last minute project, no prep, no initial proposal and no state of common understanding before the work began. So after a few hours of back and forth about what she liked and was used to seeing I got back to work with what would end up being the final product. This entry was posted on 2010.03.10 at 10.15 am and is filed under Independent. You can follow any responses to this entry through the RSS 2.0 feed. You can leave a response, or trackback from your own site. Human Verification: Sum of 2 + 5 ?